Hi! Pawn never shows upgrade info for trinkets since the best ones aren't just pure stats (they have "special effects," as Pawn's UI calls them), and stats are what Pawn deals in. Comparing based on the scores is valid if you have two really basic trinkets that don't have Equip or Use or Chance on Hit effects, but I still don't show upgrade arrows on trinkets in that case so as to not lull you into a false sense of security. I do have some plans to at some point show arrows based on ilvl for trinkets. Feature request, specifically for rings: detect if you have the same ring already equipped and only compare against that ring if so, since all rings of relevance are unique-equipped. For example, I currently have a socketed 400 Band of Multi-Sided Strikes equipped, along with a 400 Seal of the Zandalari Empire, the former of which is much stronger based on my stat weights. 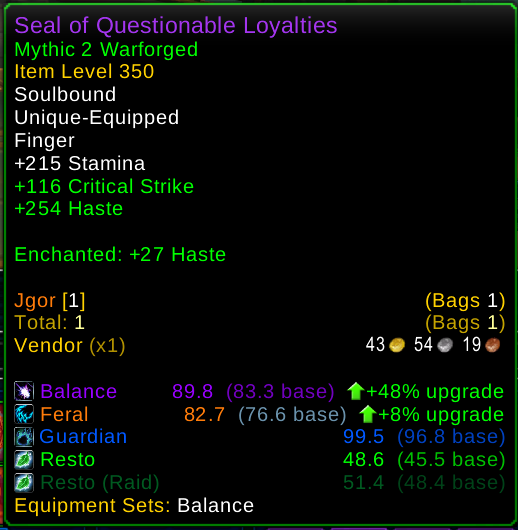 A non-socketed one dropped tonight, and Pawn showed it as a 12% upgrade, since it is 12% stronger than my Seal, despite the fact that I wouldn't be able to equip two anyway. Thanks for the suggestion! Pawn actually has some code that's supposed to do that, but it hasn't seemed to work for a while. I'll try to take a look soon—I've run into the same situation and it's a little sad when you find out that it was a false positive. There are many numbers present, and I don't have a problem with that. I like that all of that data is available, and it's valuable to me. But I feel that the data presented would be easier to parse more rapidly if the upgrade percentages were flush against the right edge of the tooltip. Even if you disagree with me about removing the word "upgrade" entirely, could I convince you to just make it a checkbox in the config that I could uncheck? Thanks for all you do, Pawn is a wonderful addon that works very well. I really appreciate all the work you put into it! Hi! Thanks for the suggestion. It looks like the image you uploaded isn't around anymore, but I'll try to imagine it. :) That seems like a pretty reasonable request; I'll try to get to that soon. I'm excited to hear that you will try to get this done soon, I'm looking forward to it! Thanks. Sorry for the confusion! That's the difference in stats, not score: 105 - 0 = +105. Take a look a couple lines above: the item on the right has 117 of the stat and the one on the left has 96, so that's +21. First, Very thanks for your add-on Pawn! Can't play wow without it now! It's absolutely an essential add-on like DBM and Skada! Since some days, with the french version of Wow.. i get this error msg in chat with Pawn when i log to Wow just after Guild Message of Day. But no problem with English version of Wow and Pawn is up-to-date! Error: Pawn may provide incorrect advice due to a potential addon conflict. 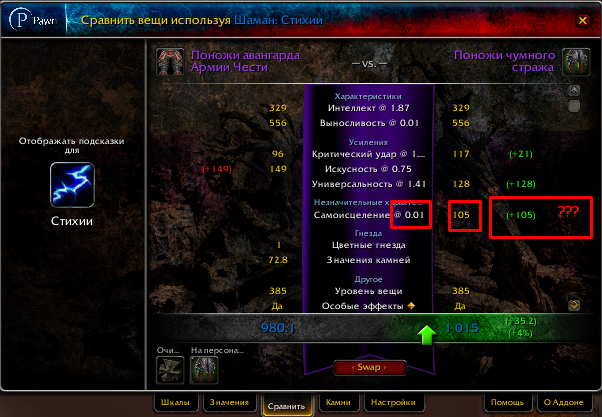 Pawn is not compatible with Combat Numbers Separator, Titan Panel Artifact Power, or other addons tat change the way that numbers appear. But i tried to log with only Pawn enabled without no other add-on but i still get this error msg and only with the french version of Wow.. I tried to remove cache and WTF folder too but same problem! I tried with the German version of wow (and Pawn) for fun and no problem like english version. i tried with older version of Pawn (2.2.35) and same dammit error msg at login (still with french wow)!! Hi! Thanks for the report. I looked into this, and it's because WoW stopped putting spaces in 4-digit numbers ("1234" used to show up as "1 234") in the French version, probably when 8.1 hit. This problem should be fixed in Pawn 2.2.37, but the error message is incorrect and just an annoyance—there isn't actually an addon incompatibility. Safari won't open the page link for pawn, says it doesn't recognize an address that starts with " curse"
Sorry, which link? Almost all of the links you'll see on this page are from Curse, not me. I am entering the numbers manually, would be nice the OFF-hand dps weight to be somewhere on the top section, not at the end of the list. I'm using manual configuration and let display the values for several specs (i.e. weight settings). That's great so far (in the tooltip). But in the inventory there's everything full of green arrows indicating improvements... mostly for inactive spec... but maybe not all... you have to check all items' tooltips. Would it be possible to add an option for changing the color of the (now green) arrow on the item's icon? Hi! It's definitely something that I'd like to do, but right now, those arrows are added by the game itself and the options I get to choose from are green or nothing. :) But yeah, I'd love to enhance it someday to support colors and multiple arrows. How do you compare a main-hand + off-hand to a two-hander? Hi! Right now Pawn doesn't have a great built-in way to do that. :( You'll need to add and compare the scores manually—you can see an item's score by putting it into Pawn's Compare tab (either side... doesn't matter), or by going into Options and choosing "show scale values and upgrade %" to put them on your tooltips. Then just add them up and see if A + B is more than C.
Definitely something that I want to improve someday, but that's the best option right now.